This illustration shows a star surrounded by a protoplanetary disc. Image credit: NASA/JPL-Caltech. Astronomers use this principle to study objects so distant they can’t be seen as more than points. 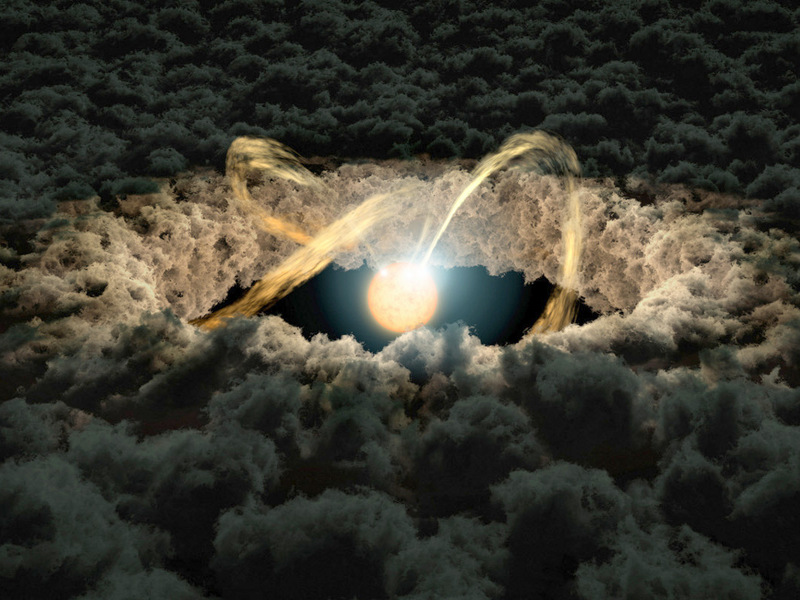 In particular, researchers are interested in calculating how far young stars are from the inner edge of their surrounding protoplanetary discs. These discs of gas and dust are sites where planets form over the course of millions of years. Meng is the first author on a new study published in the Astrophysical Journal using data from NASA’s Spitzer Space Telescope and four ground-based telescopes to determine the distance from a star to the inner rim of its surrounding protoplanetary disc. Instead, researchers used a method called “photo-reverberation,” also known as “light echoes.” When the central star brightens, some of the light hits the surrounding disc, causing a delayed “echo.” Scientists measured the time it took for light coming directly from the star to reach Earth, then waited for its echo to arrive. Thanks to Albert Einstein’s special theory of relativity, we know that light travels at a constant speed. To determine a given distance, astronomers can multiply the speed of light by the time light takes to get from one point to another. The star used in this study is called YLW 16B and lies about 400 light-years from Earth. YLW 16B has about the same mass as our Sun, but at one million years old, it’s just a baby compared to our 4.6-billion-year-old home star. 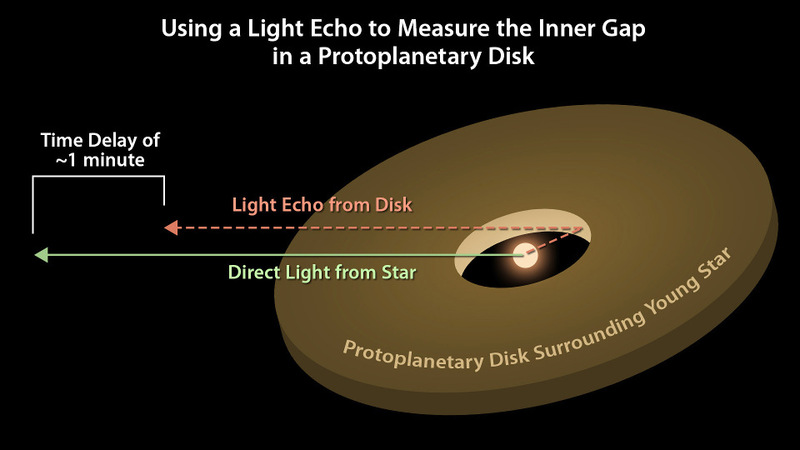 Astronomers can use light echoes to measure the distance from a star to its surrounding protoplanetary disc. This diagram illustrates how the time delay of the light echo is proportional to the distance between the star and the inner edge of the disc. Image credit: NASA/JPL-Caltech. Astronomers combined Spitzer data with observations from ground-based telescopes: the Mayall telescope at Kitt Peak National Observatory in Arizona; the SOAR and SMARTS telescopes in Chile; and the Harold L. Johnson telescope in Mexico. During two nights of observation, researchers saw consistent time lags between the stellar emissions and their echoes in the surrounding disc. The ground-based observatories detected the shorter-wavelength infrared light emitted directly from the star, and Spitzer observed the longer-wavelength infrared light from the disc’s echo. Because of thick interstellar clouds that block the view from Earth, astronomers could not use visible light to monitor the star. Researchers then calculated how far this light must have travelled during that time lag: about 0.08 astronomical unit, which is approximately 8 percent of the distance between Earth and its Sun, or one-quarter the diameter of Mercury’s orbit. This was slightly smaller than previous estimates with indirect techniques, but consistent with theoretical expectations. Although this method did not directly measure the height of the disc, researchers were able to determine that the inner edge is relatively thick. Previously, astronomers had used the light echo technique to measure the size of accretion discs of material around supermassive black holes. Since no light escapes from a black hole, researchers compare light from the inner edge of the accretion disc to light from the outer edge to determine the disc size. This technique is also used to measure the distance to other features near the accretion disc, such as dust and the surrounding fast-moving gas. While light echoes from supermassive black holes represent delays of days to weeks, scientists measured the light echo from the protoplanetary disc in this study to be a mere 74 seconds. The Spitzer study marks the first time the light echo method was used in the context of protoplanetary discs. 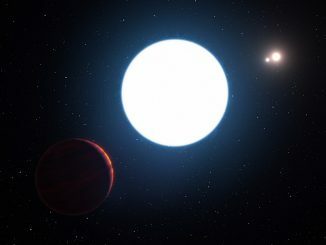 “This new approach can be used for other young stars with planets in the process of forming in a disc around them,” said Peter Plavchan, co-author of the study and assistant professor at Missouri State University in Springfield. 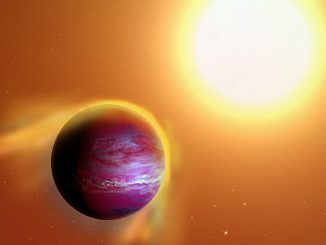 One of the best candidates for a potentially habitable exoplanet is likely an airless, irradiated wasteland that has been scorched by flares from its star, according to new research based on studies performed by NASA’s Kepler Space Telescope. 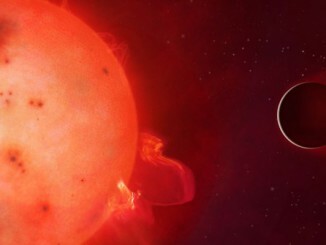 Astronomers searching for the galaxy’s youngest planets have found compelling evidence for one unlike any other, a newborn “hot Jupiter” whose outer layers are being torn away by the star it orbits every 11 hours. Dubbed “PTFO8-8695 b,” the suspected planet orbits a star about 1,100 light-years from Earth and is at most twice the mass of Jupiter.